Oregon’s state energy tax credit, called the Residential Energy Tax Credit, will expire on December 31, 2017. While Energy Trust does not administer government tax credit programs or provide tax credits, many customers applying for an Energy Trust incentive may also qualify and apply for this state energy tax credit administered by the Oregon Department of Energy. If you are considering purchasing a solar system or an energy-efficient ductless heat pump, direct-vent gas fireplace, high efficiency gas furnace, gas boiler, heat pump or high-efficiency water heater for your home, you may qualify for both an Energy Trust incentive and a state energy tax credit. Other energy-efficient upgrades are eligible for state credits but not Energy Trust incentives, including installing a wood or pellet stove, installing a solar water heater or sealing ducts. 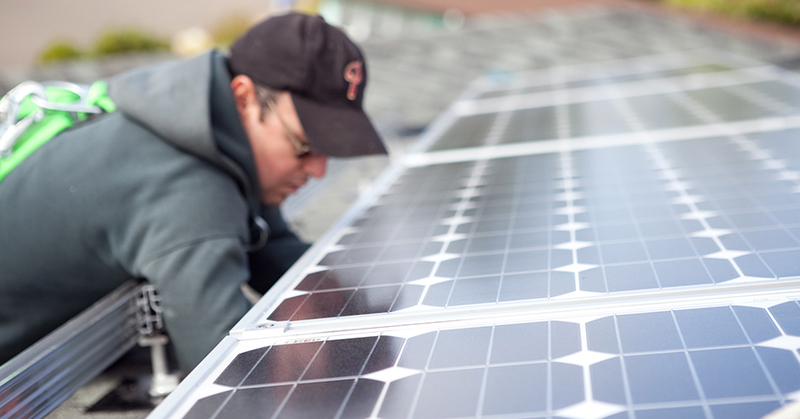 If you are considering installing a residential solar system, visit Energy Trust’s website today to get a free proposal customized for your home. Once you sign a contract with your trade ally contractor, the contractor will complete your application for an Energy Trust incentive and the Residential Energy Tax Credit on your behalf. Solar projects must meet the following deadlines to qualify for both an Energy Trust cash incentive and the tax credit. You must pick a solar trade ally contractor to do the work, sign a contract for the system you have chosen and make the first down payment on your project. Note it can take 3-5 days from receiving a bid to signing a contract and meeting this deadline. The solar trade ally chosen must submit an application for a Residential Energy Tax Credit through the Oregon Department of Energy’s PowerClerk system to reserve the incentive. Your solar trade ally contractor must complete an Energy Trust incentive application and submit it electronically. Only solar projects that have a complete incentive application submitted by January 8, 2018, will be eligible to receive both an Energy Trust cash incentive and the state tax credit. Solar projects must be operational and have passed the necessary city or county electrical inspection. Your Residential Energy Tax Credit application must be complete, including your electronic signature, and must be received by Oregon Department of Energy. If you decide to go solar after these deadlines, you can still receive an Energy Trust cash incentive. Follow the same steps, starting with requesting a solar proposal using the Energy Trust online form. Visit the Oregon Department of Energy website to learn more about Residential Energy Tax Credits. On December 31, 2017, the Oregon Department of Energy will also end the Energy Incentive Program for businesses. Visit the Oregon Department of Energy website to learn more about expiration of the Energy Incentive Program for businesses.